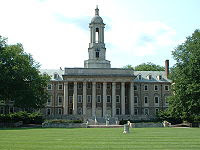 The Pennsylvania State University (commonly known as Penn State) is a state-related, land-grant university located in State College, Pennsylvania, USA. The University has 24 campuses throughout the state of Pennsylvania, including a virtual World Campus. The enrollment at the Penn State University Park campus is 42,914 with a total enrollment of over 84,000 across its 24 campuses, placing it among the ten largest public universities in the United States. Penn State offers more than 160 majors and administers a $1.4 billion (USD) endowment. From agricultural college to world-class learning community -- the story of The Pennsylvania State University is one of an expanding mission of teaching, research, and public service. But that mission was not so grandly conceived in 1855, when the Commonwealth chartered the school at the request of the Pennsylvania State Agricultural Society. The goal was to apply scientific principles to farming, a radical departure from the traditional curriculum grounded in mathematics, rhetoric, and classical languages. In 1863 the Agricultural College of Pennsylvania became the Commonwealth’s sole land-grant institution. But Pugh died the following year, and the concept of land-grant education was so novel that over the next twenty years, his successors failed to define it. As the curriculum drifted between the purely agricultural and the classical, public confidence fell; only 64 undergraduates were enrolled in 1875. Although research -- the third element of Penn State’s tripartite mission -- developed more slowly, Penn State by 1950 had won distinction for investigations in dairy science, building insulation, diesel engines, and other specialized fields. 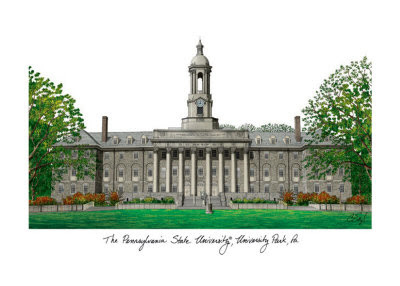 To show that the institution had come of age, President Milton Eisenhower changed its name in 1953 to The Pennsylvania State University and established a campus post office designated University Park. Research thrived under Eisenhower’s successor, engineer and scientist Dr. Eric Walker, who headed Penn State from 1956 to 1970. "Space race," "brain drain," and other catch phrases reflected intense national concern for education, and public funds were plentiful. The physical plant tripled in value, and hundreds of acres of farm and forest land were added to give the central campus room to grow (land now occupied, for example, by the Blue Golf Course, the Penn Stater Conference Center Hotel, and the Russell Larson Agricultural Research Center at Rock Springs.) Total enrollment at all locations climbed from 14,000 to 40,000 during the Walker years. The Hershey Medical Center -- a college of medicine and teaching hospital -- was established in 1967 with a $50 million gift from the charitable trusts of chocolate magnate Milton S. Hershey. Penn State has continued to respond to Pennsylvania’s changing economic and social needs. In 1989 the Pennsylvania College of Technology in Williamsport became an affiliate of the University. In 1997, Penn State and the Dickinson School of Law joined ranks. And Penn State’s new World Campus, which "graduated" its first students in 2000, uses the Internet and other new technologies to offer instruction on an "anywhere, anytime" basis. To help meet the increasing demands placed on it, Penn State has looked to philanthropy for additional resources. President Bryce Jordan in 1984 launched a six-year effort that raised $352 million in private gifts to the University. This initiative enabled Penn State to attract world-class teachers and researchers, and assist thousands of financially needy and academically talented students. The Grand Destiny campaign (1996-2003) raised $1.37 billion, further strengthening academic programs and broadening the University's service to the Commonwealth and beyond. In addition, the Penn State Board of Trustees voted in January to create a School of International Affairs, with the first classes to be admitted for the fall 2008 semester.The school will be part of the Dickinson School of Law at its University Park campus location.